ENDA KENNY HAS confirmed a new proclamation will be drafted as part of the government’s plans to commemorate the centenary of the 1916 Rising. I can only imagine what the outcome will be, especially if John Bruton has anything to do with it. Time and again on this site and elsewhere it is stressed that polling is imprecise, that it cannot but catch a snapshot in time and that even that snapshot is blurred and contingent. And yet, understandably, we focus upon them regularly – perhaps more regularly than ever before given the sheer volume of polling that is now done. No month goes past without at least one, often there are multiple polls in a month. March has been a good example of same, no less than four polls across the weeks, 13th, 15th, 26th and 29th all offering us different snapshots. And what snapshots. Fine Gael 26% (up 2%), Independents and Others 25% (down 2%), Sinn Fein 21% (NC), Fianna Fail 17% (down 1%), Labour Party 9% (up 2%), Green Party 2% (down 1%). The 15th Sunday Times-Behaviour & Attitudes (by the way, in Dublin the other day there was an advert in the shopping centre I was in for people to sign up to B&A as part of their polling panels). Fine Gael 27% (up 3%), Independents and Others 27% (down 3%), Sinn Fein 19% (down 3%), Fianna Fail 18% (NC), Labour Party 9% (up 4%). Independents and Others 28% (down 4%), Fine Gael 24% (up 5%), Sinn Fein 24% (up 2%), Fianna Fail 17% (down 1%), Labour Party 7% (up 1%). Independents and Others 28% (down 2%), Fine Gael 27% (up 3%), Fianna Fail 18% (NC), Sinn Fein 17% (down 4%), Labour Party 10% (up 3%). What can one say about all these? That broadly speaking there are clear enough bands of support, and that the polls are – again, broadly speaking, but with specific divergences – representing those bands of support reasonably similarly. Fine Gael is somewhere in the mid to high 20s. Probably the high 20s. Labour is tipping 10% or so. Fianna Fáil is becalmed at its now usual high teens. Independents and Others are somewhere in the mid to high 20s, again, as with FG, probably at the higher end of that area – for now. And Sinn Féin? High teens, very early twenties, is probably as much as one could hazard. And…er…that’s it. That’s probably as good as it gets in terms of determining support. Nor can we have any certainty that that represents the situation should an election be called tomorrow. For example, if one compares the Irish Times polls in advance of Election 2011, the last poll of the campaign was on Feb 3rd. That saw FG at 33% [+3%], LP 24% [-1%]. FF 15% [-2%], Ind/Other 15% [+4% – remember when Ind/Others were in single digits? Almost invariably before 2008 and for much of 2009! How things change], Sinn Féin 12% [-3%], GP 1% [-1%]. FG 36.1% [+3%], LP 19.4% [-5%], FF 17.4% [+2%], Ind/Other 15.4% [NC], SF 9.9% [-2%], GP 1.8% [almost +1%]. What does that prove? Simply that variability is baked into the cake. FG were, if one looks back at poling prior to the GE polling any where between 24 and 33% in 2010 (albeit on an upward trend). The LP were polling between 22 and 33% (albeit on a downward trend across the year). FF were polling between 26 and 15% (again on a downward trend. SF, bumping along between 8 and 15% (albeit at the end following the by-election with a sharp spike upwards). The Ind/Others perhaps even more strikingly polling between 9 and 15%, but mostly in or around 9/10% for 2010. Independents and Others 32% (up 9%), Sinn Fein 22% (down 2%), Fianna Fail 21% (up 1%), Fine Gael 19% (down 5%), Labour Party 6% (down 3%). That Fine Gael vote is oscillating quite a bit, no. And SF likewise. The gains by the LP aren’t that spectacular when positioned within this framework, more like a reversion to usual operating ceilings. I don’t think this is terribly surprising, and it seems to me that we can read a sense that FG offers a magnet for right of centre votes, and one that is increasingly so as the election draws near. It would not in the slightest surprise me to see FG on 30% come election day. SF, on the other hand, is clearly able to draw new support, but a good chunk of that – perhaps five or six per cent is capable of flowing elsewhere, some to the LP, perhaps some to Ind/Others as others in Ind/Other flow to FG. All of which is to suggest that I’m tending to the view that the RedC/SBP poll this weekend is probably closer to the actual outcome than any of the other polls – particularly after a tough and gruelling and very very dirty campaign that lies ahead. And by the way, word in the IT at the weekend that Kenny, perhaps inadvertently avoided couching the next election as being next year. It is far from difficult to see Kenny and FG deciding, should there be a run of polls with FG polling at the upper end of the 20s that it makes sense to go now. After all, for all the talk of recovery there’s a lot less evidence of that about than some suggest and a consolidation of FG support on, say, 30% in the polls would be good enough, near enough. Where that leaves Labour, or indeed anyone else is quite a different matter. …what’s the word I’m looking for on reading this from the SBP? Businessman Eddie Hobbs has stepped down from several of his commercial interests in order to prioritise his political work with Lucinda Creighton’s new party Renua. Perhaps others can supply it. I was reading about the latest potential industrial disputes, that of SIPTU members in Bus Éireann and Dublin Bus who are thinking of balloting for industrial action due to disagreement over talks on plans to privatise 10% of the public bus services (Labour, anyone seen the Labour Party in all this? Ah sure, what do they care?). …today the two unions suspended their involvement in the talks. They said the department and the NTA had failed to give them assurances on what will happen to staff if routes are transferred to private operators. Given what we have seen with previous privatisations of state or municipal assets – as with waste collections, the unions are right to be concerned. Anyhow, the thought struck me what are the statistics on industrial action at the moment? The number of working days lost to industrial disputes in the Irish economy almost trebled last year. Figures from the Central Statistics Office (CSO) show 44,105 days were lost to industrial disputes in 2014 compared to just 14,965 the previous year. In total, there were 11 disputes last year involving 31,665 workers and 11 employers, whereas only 11,924 workers and 12 employers were involved in industrial disputes in 2013. Can’t say I much like the framing of that – ‘days lost to…’. But hardly a surprise that it’s on the up. Though worth noting that ‘two disputes in the education section accounted for 54 per cent of the days lost last year’. A formal announcement is expected tomorrow. Bad news for FF as he is highly thought of, but very good news for Renua. McKee made the news during the Local Elections when his posters were the subject of some homophobic attacks . So his profile would be the opposite socially than some of the initial Reform Alliance TDs and Senators. For Fianna Fail, well it’s bad news, all over the country their selection conventions are taking place, in many areas the ticket will be limited to one selected locally and a female candidate added by HQ. So there are going to be an unusually high number of disgruntled candidates who fail to make the party ticket. Depending on how McKee performs in the By-Election, Renua may well be an option for some of them. How’s this from the SBP at the weekend? A Labour TD has drafted a bill to impose mandatory jail sentences on white-collar criminals. Clare backbencher Michael McNamara is seeking to get the support of his colleagues at their parliamentary party meeting this week. He said he had drawn up the bill to extend the mandatory sentencing currently in place for firearms and drugs offences to white collar crime. “If you go ahead and hold up a shop and steal €1,000, you get a custodial sentence. If you steal the whole chain of shops, you get away with it. We just don’t view it as serious,” he said. And what of this example? Last year, two former directors of Anglo Irish Bank were sentenced to 240 hours of community service for giving illegal loans to ten developers to buy shares in the bank. McNamara is planning to submit the bill for debate in the Dáil after presenting it to the Labour parliamentary party. That gives a clear insight into how the system is structured to tilt towards the class interests of some and against others, doesn’t it? Posted by WorldbyStorm in Focalín magazine from supporters of Peoples Democracy (1970s/1980s), Irish Left Online Document Archive. 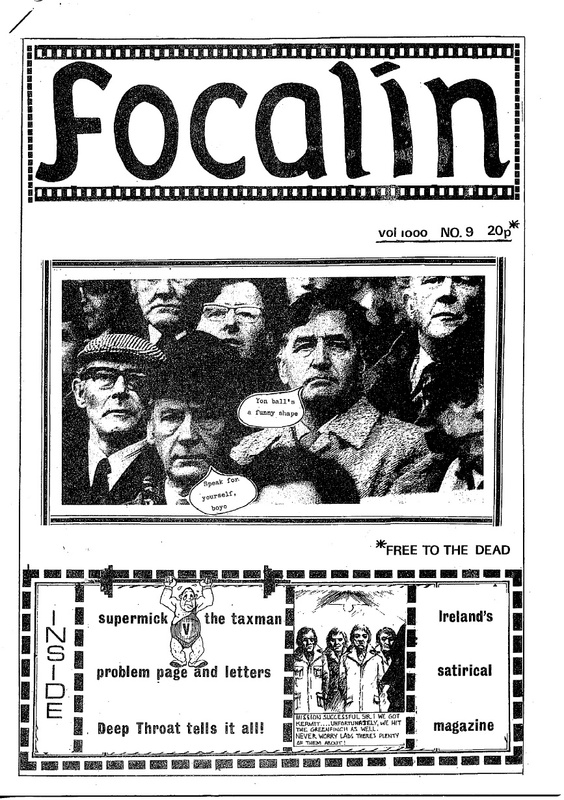 Focalín (“A wee word” for the odd reader of CLR who does not understand the First Language) was an Irish political satirical magazine produced in London in the late 1970s /early 1980s. The founders of the magazine were former supporters of the early Peoples Democracy and included an outstanding cartoonist. As with the other issue this contains cartoons, a cartoon strip, newspaper cuttings and so on. It’s certainly pitched as an in joke but there are many references to broader issues in the news. Some thoughts on same here on Slate from recently… Particularly entertaining is when it goes wrong and when supposed investments wind up as anything but. Posted by WorldbyStorm in Culture, Science. Good piece here in Slate.com this week from a lecturer, James J. Krupa, in the University of Kentucky who teaches evolution. it’s an amazing insight into just how difficult in some parts of the United States it is to teach that area of science (Krupa notes that the US is 34th lowest of ‘advanced’ states in terms of public acceptance of evolution, just ahead of Turkey). He notes that ‘rarely do I have a Kentucky student who learned about evolution in human biology’. I can’t but wonder what effect that has more broadly, in terms of pushing people from science, in terms of closing minds. It’s just disastrous on so may different levels. He also notes the ‘combative’ nature of some of those opposed to evolution… walk-outs, shouting in the middle of classes, and so on. What’s particularly troubling is – and Krupa notes this, that most ‘mainstream’ Christian religions (and it is Christians who are overwhelmingly the problem here) accept evolution. Yet as Krupa notes that ‘One student explained that as a devout Catholic he had no choice but to reject evolution. He accused me of fabricating the pope’s statements. When I explained that he could go to the Vatican website for verification or call the Vatican to talk to a scientist, he insisted that there was no such information available from the Vatican. He then pointed his finger at me and said the only way he would believe me is if then–Pope John Paul II came to my class to confirm these quotes face-to-face. The student then stomped out, again slamming the auditorium door behind him’. Clearly, so, this isn’t just about formal religious dogma, but about something much more. Identity, a means of conforming and not conforming simultaneously. Community, of sorts. Dissent. Fear and perhaps antagonism to modernity, or parts of it.